A brunch was held on Monday, March 30, 2009 to honor the organizations that provided services during the Ringgold Middle School fire. The program which was held at the Holiday Inn Express was conducted by students who spoke of their gratitude to all of the heroes who came to the aid of their school. Aisa Nicole Ramiez-Ringgold Middle School Student Council President served as Mistress of Ceremonies thanked the firefighters, medical servicemen, and policemen from throughout the Rio Grande Valley for helping during the school's time of need. "Today the kids of R.M.S. are standing strong and being patient and glad that you firefighters and policemen were there to save the rest of our school,” said Aisa. "Three-fourths of the building was affected, and yet our spirits were not," she continued. Jacqueline A. Pena, Ringgold Middle School Student Council Parliamentarian gave the invocation while Ashley Nicole Rocha, RMS Student Council Representative lead the audience in the Pledge of Allegiance and Texas Pledge. The Presentation of Colors was conducted by the High School J ROTC Cadets and Jose Alaffa, III, RMS Student Council Historian read the special remarks on behalf of the RMS Students. Alaffa spoke in a soft voice to the heroes in attendace the history of his school. He talked about a 30 year old building that has been part of Rio Grande City’s rich history and how on January 13, 2009 a piece of that history was partially burned. “This building represented to me, history, memories, happiness, and a place where I would spend my eighth grade year. He continued to tell them that he had received the news through phone calls and various text messages by other students and felt disbelief, shock, anger and disappointment. “The 7th and 8th grade students were excited and eager to move in to the new remodeled building this spring,” said Alaffa. Tragedy struck, emotions ran high and witnessing the collapse of the building right in front of them and being unable to comprehend why something like this could occur was too much for students to digest. "Mr. Peña, our principal, spoke to us and lifted our spirits," said Alaffa. This has been a lesson that life presents us and brings many challenges. The building was not just a building with classrooms but a group of people who are willing to work together to pick up the broken pieces and do what needs to be done. He feels that perseverance, hard work, dedication and pulling together in spite of difficulties is the lesson that he will carry and cherish his entire life. Mr. Roel Gonzalez thanked the Heroes for coming to our rescue and praised them for their efforts. “You fought so gallantly and boldly and for that you will always be remembered," said Gonzalez. Mr. Basilio Villarreal, Jr. Rio Grande City Board of Trustees President who was joined by his fellow colleagues, Mr. Francisco “Paco” Zarate, Mr. Noe Ricardo Gonzalez, Mr. Cesar Gonzalez and Mr. Roberto “Bobby” Gutierrez also expressed appreciation for the aid and courtesies provided. Ms. Cynthia Ybarra, Rio Grande City CISD Public Relations Officer, recognized city and county leaders along with district administrators for attending this function. She then proceeded to present plaques while the Board of Trustees, Superintendent, Assistant Superitendents and RMS principal congratulated the honorees. 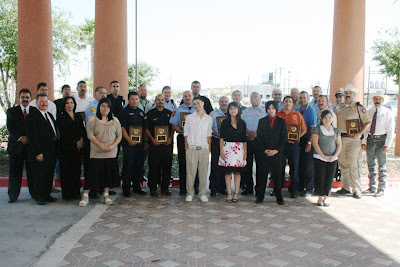 The honorees are as follows; Edinburg Fire Department, La Casita Fire Department, La Rosita Fire Department, McAllen Fire Department, Mission Fire Department, Palmview Fire Department, Rio Grande City Fire Department, Roma Fire Department, Salineño Fire Department, San Isidro Fire Department, Weslaco Emergency Services, Rio Grande City Police Department and Starr County Sheriff's Department. In closing, Mr. Adolfo Peña thanked the entities that assisted in containing the fire on behalf of himself, the students, the RMS Staff and RGCCISD Administration and Board of Trustees by saying “We would like to most graciously thank you for your courageous and heroic effort demonstrated during our tragic incident”. He continued by saying that on behalf of the students we feel very grateful that people like you whom we can call our heroes came to our community’s aid. “A true hero is one who does an act of kindness for someone else and you ladies and gentlemen are our heroes,” said Peña. He also talked about how coming to assist demonstrated not only great heroism but they became role models to the students. Mr. Peña quoted Eleanor Roosevelt as she once said, "You gain strength, courage, and confidence by every experience in which you really stop to look fear in the face”. He concluded his speech by asking for higher guidance to continue to give strength, courage and confidence to everyone present to continue to aid people through difficult times. At the end of the program honorees were asked to stay and visit with colleagues and members of the school district while their brunch was served. Rio Grande City CISD Food Services Department prepared the delicious meal. Pictured are Ringgold Middle School students and Principal, Board Members and District Central Administrators with the honorees. Honorees include members from the following organizations; Edinburg Fire Department, La Casita Fire Department, La Rosita Fire Department, McAllen Fire Department, Mission Fire Department, Palmview Fire Department, Rio Grande City Fire Department, Roma Fire Department, Salineño Fire Department, San Isidro Fire Department, Weslaco Emergency Services, Rio Grande City Police Department and Starr County Sheriff's Department.